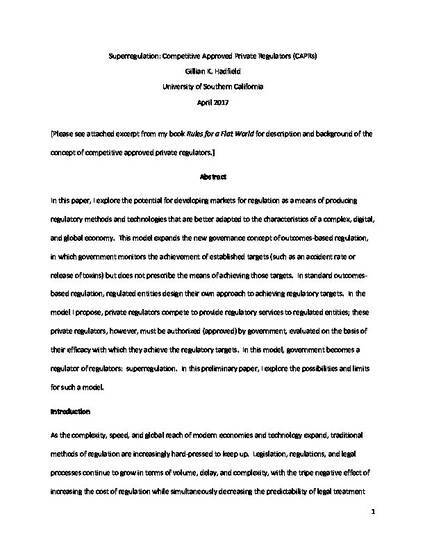 In this paper, I explore the potential for developing markets for regulation as a means of producing regulatory methods and technologies that are better adapted to the characteristics of a complex, digital, and global economy. This model expands the new governance concept of outcomes-based regulation, in which government monitors the achievement of established targets (such as an accident rate or release of toxins) but does not prescribe the means of achieving those targets. In standard outcomes-based regulation, regulated entities design their own approach to achieving regulatory targets. In the model I propose, private regulators compete to provide regulatory services to regulated entities; these private regulators, however, must be authorized (approved) by government, evaluated on the basis of their efficacy with which they achieve the regulatory targets. In this model, government becomes a regulator of regulators: superregulation. In this preliminary paper, I explore the possibilities and limits for such a model.